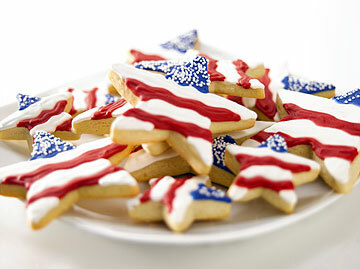 Star-Spangled Sugar Cookies are the signature of the cookie swap program. One of the great traditions of Christmas is home-baked cookies. But if you're serving with the military overseas, this is a holiday trapping you might have to pass up. Treat the Troops, a nonprofit organization of dedicated bakers, is working to deliver cookies to those who must spend the holidays far from home. Here's how you can be involved: Host a cookie swap -- a party for friends and family in which everyone brings homemade cookies to trade. Swap recipes, too, bake as a group, whatever puts you in the holiday spirit. For every cookie swap party registered by Saturday at www.greatamericancookieswap.com, DuPont Teflon will make a donation to Treat the Troops, which will use the money to bake and ship cookies. More than 16,500 parties have been registered nationwide (at least 25 in Hawaii), and DuPont has committed to fund a year's worth of cookie shipments. Your party can be held at any time, but for the sake of sending a message of holiday good wishes, DuPont is hoping that lots of parties will be held on Saturday. Visit the Web site for tips on hosting a party and cookie recipes. After your party, you can post photos and stories on the site. You might decide to send a box off to someone you know serving overseas. Or, bring the message of sharing home -- use your cookie party to bake for a needy group in your community. Cream butter and sugar until light and fluffy (about 3 minutes). Beat in egg and vanilla and mix an additional minute. Divide dough into plastic bags and refrigerate 6 hours (or freeze 20 minutes). Roll out dough on a clean, floured surface. Cut with star-shaped cutter. Place each cookie on a nonstick baking sheet. Bake 12 to 15 minutes, or until edges are golden, rotating halfway through. Let cool 3 minutes, then transfer cookies to wire racks to cool completely. To decorate, frost each cookie with white icing (see picture) and immediately sprinkle blue and red sanding sugars. Let dry 24 hours.